Saturday, the Russian River Valley Winegrowers’ Millennial Council will emerge on the Summer wine event scene hosting Single Night – a single night, single vineyards, Russian River Valley’s next generation. Not just an event for single people as the name may suggest…Single Night will showcase the best of the Russian River Valley; including single vineyard wines, single bites of food from local food producers, all on a single night in June. 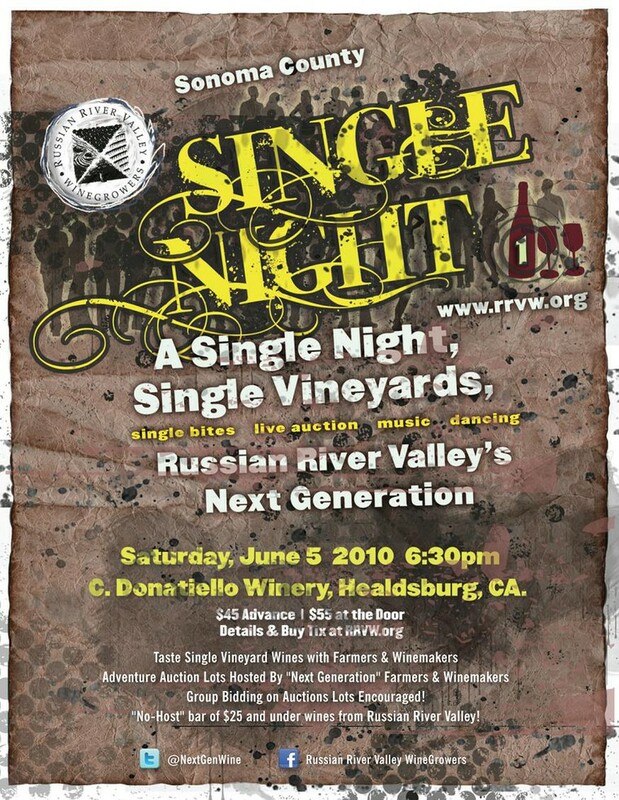 Single Night is June 5, 2010 at C. Donatiello Winery at 4035 Westside Road in Healdsburg from 6:30 p.m. to 10 p.m.
Read more about the event at Inside Sonoma, Wine Country Unfiltered or the Russian River Winegrowers website. The Farmer may just be there…well, at least I asked him to keep his busy social calendar open in case his Millennial Daughter needs a last minute date!…we’ll see.